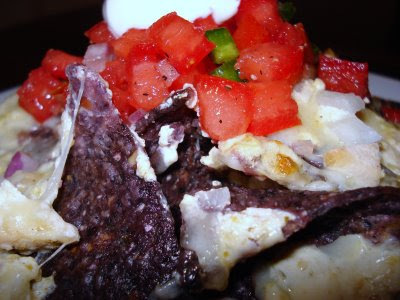 In honor of the day I came up with these red, white and blue nachos, so yummy and I'll share the recipe here with you. And while it's a little late for this 4th I wanted to let you know about a fun party idea for any patriotic holiday. Just invite a bunch of people and have them bring food with the qualification being that it is red, white or blue (you may want to add more qualifications unless you just want a bunch of desserts, which are the easiest red, white & blue things to come up with). But it's really fun when people get creative with it. These nachos would be great for example. I went to a party like this a few years ago and took two chicken pot pies, one with a blue crust, one with a red crust (food coloring of course), but sorry, no pictures. Anyway, hope everyone has enjoyed this Independence Day! Combine sour cream and salsa verde to make the sauce. Heat in a 425 degree oven until cheese is melted and everything is heated through about 10 minutes. I like to broil for the last few minutes. Top with salsa and sour cream if desired and serve.